A willing, responsive horse should back up when asked. Backing up isn't a natural response for horses. As a prey animal, your horse's instinct is to move forward to get away from danger. Backing is part of both English and Western horse show patterns, and backing can help you maneuver tight turns on the trail. Teaching your horse to back up is easier when you conduct a training session in a riding arena. You can use the arena fence or walls to prevent your horse from moving forward. After warming up at all three gaits, ride your horse so that his nose is facing the arena rail or wall. Ask him to halt so that all four legs are squarely under him, like the legs on a table. Hold the reins gently with light contact. Sit squarely in the saddle. Gently and carefully pull back slightly on the reins while simultaneously squeezing with your legs. Shift your body weight so that you are using your seat to push your horse forward. The idea is to push the horse forward with your body but hold him back with the reins. He will back up when he realizes he cannot move forward. Horses move away from pressure, so when he runs into the pressure on the bit, he should tuck his head under and begin to back up. The horse should drop his head and round his back up and under your seat. You'll feel his hocks engage and the tail and hocks tuck under a bit as he backs up. 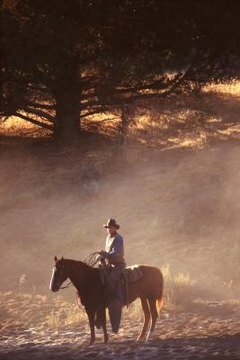 Western horses should back up quickly, smoothly, and in a straight line. Several common problems can occur when the horse is learning how to back up. If your horse tosses his head in the air and refuses to move forward, he may be trying to evade the bit. You're pulling too hard on the reins and not giving him the proper cues from your leg and seat. A horse that moves forward, rather than backwards, needs a firmer grasp on the reins. In both cases, practice squeezing with the seat while gently pulling back on the reins to bring the horse's body up, his head and tail tucked under, until you get the desired back.